The Head of the Catholic Church Of Fiji Archbishop Peter Loy Chong has apologised to the people as he says that he had used outdated statistics and sources in a newsletter that was read by all the priests in all the Catholic parishes in the country on Sunday. 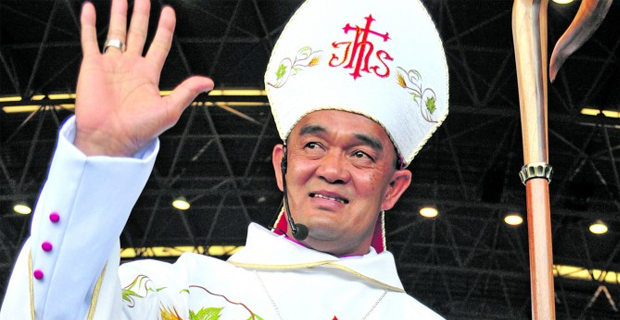 Archbishop Chong says he has now corrected it on a facebook post and has also made an apology. He says he has made a mistake and has learnt from quoting an outdated source. The Head of the Catholic Church says he put the newsletter together and he is responsible for it. When asked on whether a corrected version of the statistics will be shared by the priests at all Catholic parishes this Sunday, Archbishop Chong says that he will advise all the priests. When asked on people raising concerns that the newsletter seems to be heavily slanted against the government, Archbishop Chong says he is not mentioning any party. Serious concerns have been raised by many people after the newsletter that was prepared by Archbishop Peter Loy Chong, and distributed widely, was found to have had misleading and outdated information. In Archbishop Chong’s message which was read out to all the parishioners on Sunday, he says that VAT has been increased from 12.5% to 15% which he said was increasing the cost of living for the poor, the government has regressive taxation which is taxing the poor and helping the rich since 2006, the Employment and Unemployment Survey says that in Fiji overall poverty increased from 30% to 45%, in rural areas poverty increased from 34% to 55%, in urban areas poverty increased from 25% to 35% and that the poverty of employees not covered by FNPF increased from 50% to 60%. After analysing the data presented by Archbishop Chong to all the priests who then read out the same information at all the Catholic churches, Fijivillage has received confirmation after assessing the official statistics that the poverty and taxation statistics being quoted in the newsletter are factually incorrect. The official statistics on poverty are compiled and released by the Fiji Bureau of Statistics. Poverty statistics are usually sourced from the Household Income and Expenditure Survey. Official numbers show a declining trend – 35% in the 2002/2003 Survey to 31% in the 2008/2009 Survey and 28.1% in the 2013/2014 Survey. Archbishop Chong’s message claims that the numbers have been sourced from the Employment and Unemployment Survey but these surveys do not capture poverty numbers. Similarly rural poverty has also declined to 36.7% in the 2013/2014 Survey from 43% in the 2008/2009 Survey and 40% in 2002/2003 Survey while urban poverty is around 19.8% in the 2013/2014 Survey, declining from around 28% in the 2002/2003 Survey. Fijivillage also confirms that VAT is 9% and has not been increased to 15%. The income tax threshold is also $30,000 which means people who earn $30,000 or less do not pay income tax. In his message in the newsletter, Archbishop Chong says that during the month of October, he will use the Sunday Homilies to help people form their conscience and practice their political responsibility.